"I strive to express the spiritual nature of the Universe. Painting for me is a dynamic balance and wholeness of life; it is mysterious and transcending, yet solid and real." 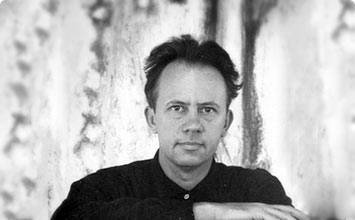 The painter Richard Pousette-Dart was the youngest member of the first generation of Abstract Expressionists. His early work, marked by thick black contour lines and primitive themes, gave way to a freer abstract style in the 1940s, and to light-infused, pointillist paintings in the 1950s and 1960s. Although initially associated with the classic Abstract Expressionist angst, his work maintained a more transcendent and positive quality to it, increasingly focused on the expression of spiritual ideals in paint and color. Pousette-Dart's paintings are imbued with a sense of the spiritual and the mythic, evoking primordial forms and scenes. The artist's experiments with abstraction began with abstracted animal shapes, but soon evolved into formal explorations of textural handling, built-up surfaces, and intense color. Despite being present for the iconic Irascibles photo by Nina Leen in Life magazine, Pousette-Dart was one of the more independent artists within Abstract Expressionism, leaving New York City at the height of the movement and pursuing an optimistic, life-affirming art style to the end. This work, an abstracted study of an animal head, shows Pousette-Dart's interest in tribal and Jungian themes of confrontation and sacrifice. 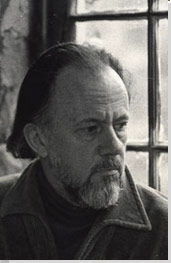 These themes are the main focus of his work in the 1930s and early 40s. The oval shape is repeated and modified to suggest eye, horn, egg, yolk, and fetus, all surrounded by his characteristic black contour line. Symphony No. 1, The Transcendental is a large painting, considered by many to be the first mural-scale work of Abstract Expressionism. Evoking at once musical notes, cell-like squiggles, and the orbits of a planetary system, the work suggests the universal forms that inhere in the world at large. While the spiritual theme and many of the shapes are familiar from his 1930s work, Pousette-Dart's style has become more painterly and textured. Pousette-Dart created a number of works in the early 1950s like this one, using pencil and white paint on canvas or board. Originally prompted by a tight budget, the approach shows Pousette-Dart exploring an ethereal side to the abstract grids of Picasso and his New York School heirs. One can discern the characteristic ovals, eye-shapes, and arcs, but rendered in a softer and more --- manner. Pousette-Dart developed his pantheon of diamonds, circles, and organic shapes into vertical compositions in the 1950s and 60s. The thickly layered forms in this work suggest an underwater seabed, a stained glass window, or the streaming refractions of filtered light. Where in earlier paintings there are still some distinct, quasi-representational forms, the elements here are abstract and fluid, diffused across the colored ground. With its allover style of colored dots, Golden Presence exemplifies Pousette-Dart's pointillist approach. Up close, one can see the highly textured surface daubs and marks. From far away, the densely layered surface suggests a landscape, garden, or other spatial presence. Pousette-Dart here evokes the spiritual element not through suggestive subject matter but through color, texture, and the veil-like, shimmering surface of the work. In Now a Turning Orb, Pousette-Dart employs familiar forms from his career, like nested circles, pointillist dots, and curved arcs and lines. Here, as in many of his late works, Pousette-Dart balances a sense of structure and harmony (in the even weave of the gridded forms and the central circle) with dynamism and energy (in the vibrating brushstrokes and the sense of whirring motion).